with a population nearing 9.5 million people, they host the second largest number of Syrian refugees in relation to their population, worldwide. This mounting humanitarian crisis places a tremendous strain on the refugees, the Jordanian government, and on organizations that are all trying to cope with a nearly impossible situation. Since 2010, the Polus Center has been working in the region providing rehabilitation services to civilian war wounded victims of conflict. Working closely with Jordanian and Syrian rehabilitation facilities in Amman, Jordan, the Polus Center has trained rehabilitation staff in prosthetics, orthotics, physical therapy and wheelchair seating and fitting. In 2013, through a generous grant from the U.S. State Department’s Bureau of Political-Military Affairs/Office of Weapons Removal and Abatement (PM/WRA), and partnerships with several rehabilitation programs throughout Jordan, the Polus Center began providing Syrian refugee children with prosthetic care. Those experiencing limb loss received mobility devices and rehabilitation services, including artificial limbs, wheelchairs, braces, and physical therapy. The Polus Center has a unique person-centered approach to direct assistance. This allows the technicians to listen, assess, and design solutions for each patient on an individual basis, building trust and a personal connection. These critical services provide an essential first step toward helping regain mobility, dignity, and self-confidence. Khaled, a young Syrian refugee, receives expressive art therapy at the Al Bader Center in Amman, Jordan. Syrian refugees, especially those who have experienced limb loss, have been exposed to inexplicable atrocities of war. While the rehabilitation services offered through the Polus Center and ADT had greatly improved mobility, we recognized that many of the child refugees receiving limbs have also suffered the trauma of being caught in the crossfire of the Syrian conflict. Many of these children have lost parents, siblings and even entire families. Large numbers of child refugees live in refugee camps where crime is rampant, privacy is limited, and they must sacrifice their education to find work to support their families. Funded by a grant from the Dorothea Haus Ross Foundation, this therapeutic intervention includes both expressive and cognitive therapies. It provides direct trauma counseling services designed to reduce the debilitating effects of PTSD. Providing prosthetic limbs and simultaneously helping children process their experience aids in their recovery, It also helps them develop new coping skills, foster personal growth, and increases their sense of security. Along with physical therapy, it is a critical component necessary to offer the best chance of recovery. Trauma experienced by children can be so painful that it is not possible for them to process or express their experience using language. Expressive Art therapy allows recovery to begin through an alternate medium, allowing gentle and safe work when children are in the early stages of the healing process. A progression emerges as they respond and travel a continuum of recovery through the therapeutic process. Eventually, they can talk about their experiences in a group setting, participate in one-on-one therapy sessions, and even provide crucial peer support by greeting and interacting with new arrivals. The Polus Center training offers post graduate prosthetics upgrading opportunities to many Syrian and Jordanian technicians. Meeting, observing, and listening to the unique challenges and concerns of each patient builds trust, and a greater understanding of what is required in terms of individual prosthetic design. Together with our partners, we bring highly skilled prosthetists from around the world to train technicians in biomechanics and the fabrication of artificial limbs. 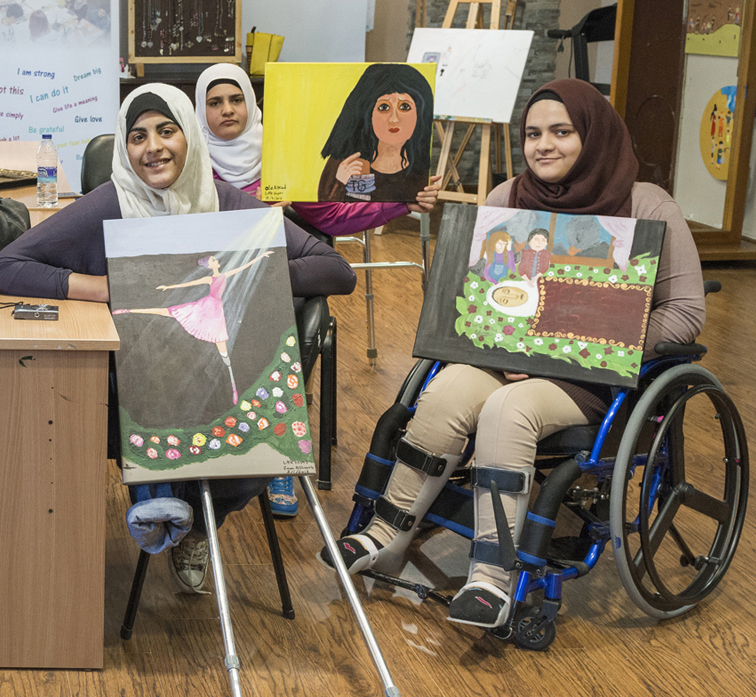 Our partner Asia Development Training, a non-governmental organization in Amman, Jordan, ensures local involvement and is especially committed to training women and Syrian refugees who themselves have experienced limb loss. This “train the trainer” program model offers professionals and paraprofessionals instruction in prosthetic/orthotic construction and also in physical therapy. These direct assistance and capacity-building efforts create continuity of care for victims, economic opportunities for trainees, and support for Jordan in the monumental task of caring for the influx of over 660,000 Syrian refugees. 1 Migration Policy Institute Report (Lauren Rogers-Sirin & Lauren Rogers-Sirin, 2015). http://www.migrationpolicy.org/research/educational-and-mental-health-needs-syrian-refugee-children. 2 RTRC a department of Boston Children’s Hospital in the U.S. and is a Category II Treatment and Services Adaptation Center under the National Child Traumatic Stress Network.